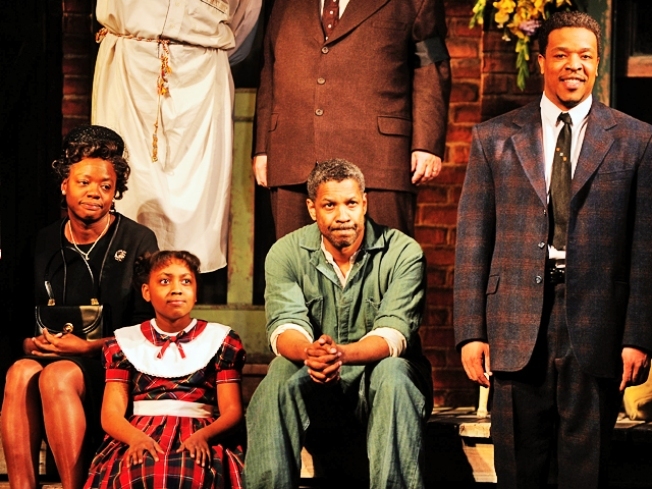 (L-R) Actors Viola Davis, SaCha Stewart-Coleman, Denzel Washington and Russell Hornsby onstage during the curtain call for the Broadway Opening of "Fences" at the Cort Theatre. Family is not a bad place to start when searching for ways to portray the lead characters in "Fences," August Wilson's most popular and perhaps most personal play. Denzel Washington and Viola Davis both looked into their own lives to find bits and pieces of the husband and wife they play in the vivid Broadway revival of Wilson's drama set in 1950s Pittsburgh. And their introspection looks like it paid off. 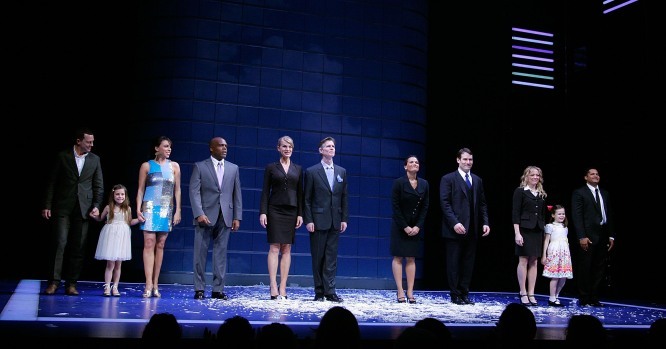 The critically acclaimed production has snared 10 Tony Award nominations, including nods for its two stars and its director, Kenny Leon. This "Fences" is a prime example of Broadway's fascination — some might say necessary fascination these days — with stars to sell tickets for more serious fare. And Washington does, judging from gangbusters business the show has been doing since opening last month, not to mention the cheers that rock the Cort Theatre when the actor first saunters on stage. He portrays Troy Maxson, the larger-than-life garbage man whose dashed dreams of baseball glory (in a white world of pro ball) have given him a rigid, embittered sense of responsibility. A responsibility that has a profound effect on his wife, Rose, and particularly his son, Cory. Washington was first approached by producer Scott Rudin to do a film version of "Fences" but before deciding the actor went back and read the original play, which he had seen in its initial 1987 Broadway run starring James Earl Jones and Mary Alice. He opted to do the stage version instead. Washington's reasoning? "The opportunity to interpret a masterpiece," he said. "Plus, it's the right time, and I'm the right age. I'm 55. And Troy is 53 years old. So I had to do it now." And the play's themes, particularly of the black migration to the North, and the stories those themes tell, resonate with Washington. "My father was raised in the South and he came to New York," the actor said. "Some came and went (like the people in most of Wilson's plays) to Pittsburgh. I know that story. I am that story." Davis, too, found an immediate connection with Rose, thinking of her own mother who started having children at age 15 and "kind of never realized her gifts and talents. "I love the whole journey that Rose takes," Davis said, explaining how the woman's lack of choices forced her to do certain things. "Rose is a survivor," the actress said. "I think you have two choices in life. You can either cave in on yourself or you can thrive. You can find some way of working through (your problems) ... and Rose does. She is a liberated woman (in an unliberated time) ... but she doesn't let the times dictate to her. "And I know Troy, too. Troy is my father. My uncles. Everyone is familiar. And you draw on all of those experiences," she said. Davis also knows Wilson, who died of liver cancer in 2005 at the age of 60. She is veteran of several of his Broadway productions. Davis already has a featured-actress Tony for her work in Wilson's "King Hedley II" in 2001 and five years earlier, she appeared in his "Seven Guitars." The two plays and "Fences" are all part of Wilson's decade-by-decade, 10-play cycle celebrating the black experience in 20th-century America. But no one quite matches Leon's experiences with the playwright, whom the director first met more than 20 years ago. At the time, Leon was a National Endowment for the Arts directing fellow studying at Baltimore's Center Stage. And he brought some of theater's board members to New York to see the original "Fences." It transformed him. "For the first time, I felt my grandmother's rhythms, my mother's rhythms and the rituals of African-Americans," he said. "Theater can be even more than a great play that has a beginning, middle and an end. "After that, August and I formed a relationship," Leon continued. "The following year, I was hired as an associate at the Alliance Theatre (in Atlanta), and August told me I could do his plays." Leon took him at his word. The Broadway revival of "Fences" is his fifth production of the play, including a staged reading in 2008 for a Wilson celebration at the John F. Kennedy Center for the Performing Arts in Washington. But with this latest revival, Leon wasn't looking to repeat what he had done before with "Fences" or with what he had accomplished as director of Wilson's last two plays on Broadway, "Gem of the Ocean" in 2004 and "Radio Golf" in 2007. "I'm interested in the actors coming into the room and surprising me," the director said. "There is no other person who is going to play Troy like Denzel Washington. There's an athleticism, a vocal range, an emotional depth to his work. "I want to use that and put it up against Viola's earthiness, her understanding, her rhythms and tempos — her understanding of that which is maternal. You put those two personalities together and you are going to capture something that neither one of them had by themselves." Washington never did get to talk to Wilson about "Fences." But he recalled the one time he spoke at length with the man, visiting the playwright at his home in Seattle one rainy afternoon. "He was just cool and regular," the actor recalled. "He was working on 'Gem of the Ocean.' I don't know if he said he wanted to write something for me, but that's why I was there. "But I just remember August talking about how — because he hadn't written it yet — the characters (in 'Gem') were going to come into the house and talk to him. ... He was telling me he didn't know what it (the play) was going to be yet but the characters were going to tell him. He said, 'They'll come in and start talking and I'll just write it down.'"